More North Carolinians can identify the state’s “elevator queen” than the legislators setting the agenda on statewide issues. According to an Elon University Poll, 49 percent of registered voters could match Cherie Berry – whose face is plastered in elevators across the state because of her role in regulating them – with her role as North Carolina commissioner of labor. But a majority of those respondents didn’t identify her by her official title. Rather, they said she was the “Elevator Lady” or the “Elevator Queen.” Voters in urban areas were more likely to recognize Berry than those in rural areas. When I first moved here back in 2002, I’m pretty sure it was just the signature. But now it’s a photo, too, and I’m pretty sure it’s become more prominent. And, yes, she keeps winning statewide even in years when most other Republicans lose. What should we take away from this study? As political scientists have long thought, political advertisements can affect elections — even in the most unorthodox forms. With this kind of advertising, incumbents don’t have to spend campaign funds — but they still come out of the election at a higher floor than when they began. If they do learn from Berry’s elevator pictures, they may realize that such advertising can help when they try to rise to higher political office. In a May 2013 poll, Berry performed strongest of all Republicans tested against then-Senator Kay Hagan (D-N.C.) for the U.S. Senate seat Hagan was vacating in 2014. While Berry didn’t run for Senate, her picture in North Carolina elevators continue to bring up her political prospects as she seeks a fifth term as labor commissioner in 2016. And, yes, of course she won in 2016. And, yes, she’s a good Republican who has used her position to entirely fair the working people of this state. Over the course of the past four decades, though, gun ownership has firmly sorted along party lines. In a recent paper, University of Kansas political scientists Mark Joslyn, Don Haider-Markel, Michael Baggs, and Andrew Bilbo found that the impact of owning a gun on presidential vote choice increased markedly from 1972 to 2012. 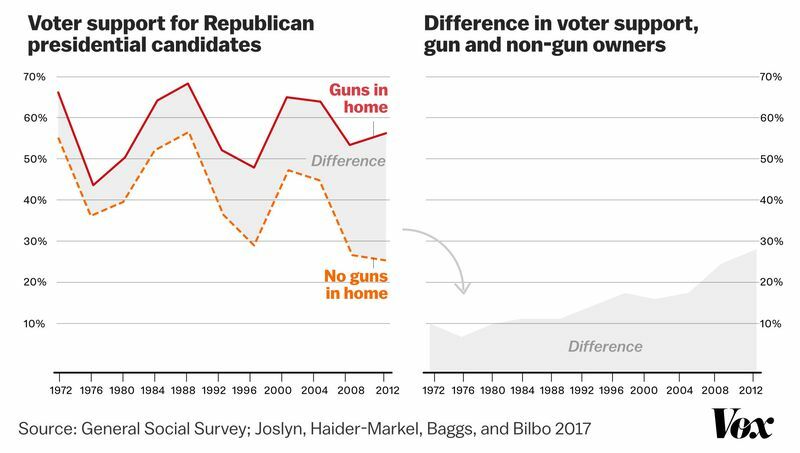 These regressions can’t prove causality — that is, they can’t prove that gun ownership causes people to vote Republican. But they do show that the phenomenon we’re seeing isn’t just an effect of which racial groups or genders are likely to own guns. The conservative themes that Lacombe alludes to in the gun debate — an individualist spirit, paired with a respect for traditional family values — can be broken down in a couple of ways. First, there is a divide between an individualist attitude, which places a premium on individual autonomy, and a communitarian attitude, in which the community or nation is in this together and sometimes needs to make individual sacrifices for the greater good. Second, there’s a divide between a hierarchical worldview, where traditional practices and distinctions between genders, ages, social groups, etc. are viewed as important and justified, and an egalitarian worldview that views such distinctions as fundamentally arbitrary. Donald Braman, a professor at George Washington University law school who holds a PhD in anthropology, has, with his Yale colleague Dan Kahan, examined the gun debate through these cultural divisions, using an approach known as the “cultural theory of risk.” Pioneered by the late anthropologist Mary Douglas, the theory holds that people’s cultural environments, particularly the groups of which they’re members, help determine what people view as significant risks: Is the more significant threat “insufficient control of concealed weapons, leaving citizens vulnerable to deliberate or accidental shootings”? Or is it “excessive control, leaving citizens unable to defend themselves from attackers”? This perception, in turn, colors how people interpret empirical evidence and form conclusions about policy. People with more hierarchical but simultaneously individualistic worldviews are less likely to support gun control, and people of a communitarian, egalitarian bent are more likely. “With the exception of gender, no other characteristic comes close to the explanatory power of cultural orientations,” they write. “Cultural orientations have an impact on gun control attitudes that is over three times larger than being Catholic, over two times larger than fear of crime, and nearly four times larger than residing in the West.”..
What no one seems to know is how to make the debate less about identity and more about evidence — or if such a move is even possible. It might be that the most we can hope for is an ever-escalating clash of identities that somehow results, against all odds, in sensible policy. What this means as much as anything is that you really difficult to argue policy with gun owners. Strong identities mean identity protective cognition which means preserving the value of group identity over the value of actually being accurate and comprehending the reality of the situation. It doesn’t matter how much data and research you show a gun lover about the inefficacy of our current policies for keeping Americans safe, the need to protect the “more guns = better” identity will outweigh the need to have rational discussion of policy. Of course, the more non-gun-owner become identity, the even harder it will be to actually have rational, empirically-oriented debate and policy. Also, somehow I missed a terrific Upshot feature largely around this in October as well. Check that out, too. And, lastly, I really want to do some political science with “gun owner” and a social identity scale. The first, from Republicans, said the FBI used information that was ultimately funded by Hillary Clinton’s campaign and the Democratic National Committee to obtain the warrant on Page. It said that finding and others amounted to “a troubling breakdown of legal processes established to protect the American people from abuses related to the FISA process,” a reference to the Foreign Intelligence Surveillance Act. The FBI disputed the accuracy of the Republicans’ statements, and Democrats fired back on Saturday with their own memo saying the bureau had been unfairly maligned. Page has acknowledged that an FBI wiretap detected suspected Russian spies discussing their attempts to recruit him in 2013, and told congressional investigators that he was interviewed by the FBI and cooperated as they investigated the men, who were ultimately charged with acting as unregistered foreign agents. By the Democrats’ telling, the bureau told the court specific details of where its new information on Page came from. No, not “by the Democrats’ telling” by actual reality!! Damn this is such irresponsible journalism. We’re left with some stupid “Democrats and Republicans disagree” take that leaves the average reader no better informed instead of the far more accurate, “here’s what’s real, and here’s who’s telling you the truth about it.” There’s your damn media bias in action. I swear, hard to argue against the proposition that today’s GOP is just one giant con job. But, hey, Paul Ryan is kicking poor people out of their hammock thereby making their lives better. Jeremy Black. Via Wild Birds Unlimited Facebook. missed in discussion of comparative violence–survey estimates indicate US has markedly *lower* prevalence of non fatal assault victimization. Not all these gaps are huge, but point being, in many key ways, the NRA is not mainstreamWayne LaPierre speech. That’s why I’m so happy to see these corporations cutting ties with the NRA. Will it make any immediate meaningful change? No. But it does show that bland, play-it-safe-corporate America now (quite appropriately!) sees the NRA as outside the mainstream just like corporate America now largely sees anti-gay discrimination as unacceptably outside the mainstream. And if you have any doubts about the NRA being outside the mainstream, just listen to pretty much any ever. This is not going to turn things around immediately and, no, we cannot count on corporate America to save us, but the more the NRA is stigmatized, the less politically powerful they become.